FolderMill provides automated conversion of input documents to PDF, JPEG, TIFF, or other image formats and automated printing these documents on desktop or enterprise printers. The software's ease of use makes it possible to deploy the system in minutes for a large number of users. The basic idea behind configuration is to create Hot Folders and set of Actions. It is possible to set several actions set for each Hot Folder, e.g. one applies watermark and prints on a defined printer, and another saves input document as PDF. Individual Hot Folders are usually created for different workgroups or different tasks. A new user connects to the system simply by creating shortcuts to the input and output folders. Several Hot Folders may be created for a single workgroup (department) each with a certain functionality. For example, one Hot Folder may help prepare material for publication whereas another one creates compact archives. No additional software needed on workstations. The only thing required is to install the FolderMill on a selected network server, define Hot Folders, and map the desired network folders for selected users in system policies. More than 40 different document types supported to print or convert. Complete list of supported input formats. Export into 4 formats. Documents of any type can be exported into PDF or image files in popular formats: TIFF, JPEG, PNG. Keep printer settings. FolderMill saves printer settings for each individual Print Document Action. Virtual printers support. Ability to set a virtual printer for Print Document Action increases the number of supported file formats. We provide commercial license of Universal Document Converter virtual printer by request. Work with multipage documents. Several documents of various types can be combined into one multi-page file. Ease of use. To export any types of documents as PDF or images of the desired format, just copy them into the input folder. A few moments later, the converted document will appear in the output folder. Advanced quantization algorithm. An advanced image quantization algorithm produces extremely high quality copy even when converting into a black and white format. High resolution. Resolutions of up to 1200 DPI produce documents that preserve all the elements of the artwork of advertising materials and the smallest detail on drawings and circuit diagrams. Small system footprint. Small system footprint helps export documents of almost any size with hundreds of pages. Quick configuration. The FolderMill Control Panel makes configuration very quick and easy. Multi-language user interface. FolderMill is available in 6 languages: English, German (Deutsch), Spanish (Español), French (Français), Dutch (Nederlands) and Russian (Русский). Whether you have a local area network (LAN), a Windows Server, a network-attached storage (NAS) device, a virtual machine, an FTP server, a SharePoint server or a cloud-based virtual file server, FolderMill can be integrated into your IT environment. It will let your employees convert to PDF or images files and print documents over a network. Offices and schools often have local area networks. LANs are useful for sharing devices such as printers, documents or storage among network users. This helps a business cut down on the costs with multiple printers and other resources. Certain software for certain file types must be installed on a main workstation or server PC only, whereas the end users connected to your office network do not need to install anything. Integrate FolderMill into your office network, and your employees won’t need to install printer drivers, libraries, additional file processing software or software products. All they will have to do is just drop their documents to a shared folder and get printouts from a printer. If you have a printer connected to the main computer, which is shared by your end users within а network, they actually don't need to install a network, wireless, or Bluetooth printer on their own PC. Again, they just drop new files to the shared folder. FolderMill is simple and cost-effective for network printing as well: it saves time and doesn't need constant IT support. Once configured, it works without users' or system administrators'attention. Automated printing of documents is performed by FolderMill with pre-configured settings. And there's no need for print servers, because a common laptop or a desktop PC will do. It can act as a print server. Whether you print or convert documents, you would usually need to open a file, start file dialog (File > Print), make necessary settings, select a printer and click Print. Or open a file, find Save as... or Export option, select certain file format and click Save. 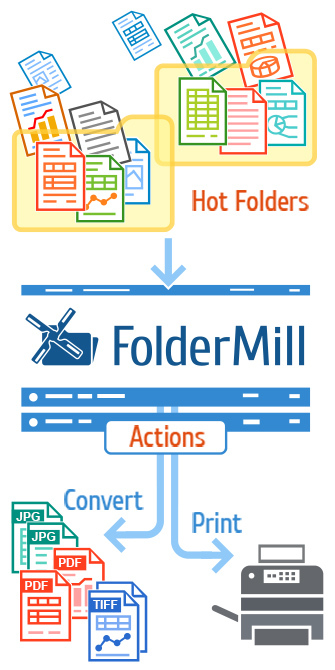 With FolderMill, you can forget about it. Once configured, it does the work for you as soon as end-users copy them to a Hot Folder (which can be shared via LAN or Google Drive). The installation process of FolderMill is very intuitive. Simply launch the installer and follow the instructions on the screen. FolderMill is available as a server and workstation edition. For the best experience within an office network, use FolderMill Server Version, which can operate in Windows OS Service mode. This allows running the program when Windows starts and setting up a user-unattended server system, so that FolderMill Processor works in the background without user logon. In order to enable this mode, please enable Run FolderMill Processor as service option (available in server edition). FolderMill Workstation Version can be installed under a single Windows user account. You can create. It will also allow you to run FolderMill as a service and start FolderMill Processor when Windows starts. Once installed on server you can create as many Hot Folders as you need and share them for end-users.